Learn how to manage your project keys in the editor. Once you open a project for editing, you will have a list of keys with their snapshots, translations and other attributes. Let’s take a closer look at the available controls and the key editor itself. Icons next to the key name allow you to perform key-related actions with a single click. Comments: team work usually involves discussions on particular keys. Once you leave a comment for a key, it is automatically emailed to people, who have the same contribution rights on the languages as you. Copy link to clipboard: copy a link to the target key to your clipboard. Duplicate this key: create a copy of the current key. 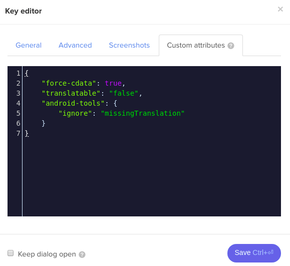 Google-translate empty values: click to populate all empty values of the current key with automatic translations provided by Google translation engine. This may take a couple of moments depending on the job volume. Hide from contributors: hide the target key from all other contributors/translators. Delete key: remove the key and all related translations. Warning: you cannot undo this action so think twice before deleting the keys. Screenshots: link one or multiple screenshots to this key. Continue reading to learn more about the screenshot manager. Key editor: click the key name to bring up the key editor. The key editor is described in more details further in this article. To access Key editor, click the key name itself. Read below to learn more about the key editor. Lokalise supports four platforms – iOS, Android, Web and Other. Assigning a key to one or multiple platforms actually means that the key will only be associated with the platform-specific file formats when you export the localization files. For example, assigning a key to the iOS platform means it will be included with the Apple Strings and Apple Xliff file exports, and will be excluded from JSON export (as JSON belongs to the Web platform). Each key can be attributed to a single filename per platform. You can set the attribution using the key editor: click the key name in the editor, then navigate to the Advanced tab. Use the built-in tagging of the editor to logically group your keys. Click the tag icon and either enter a new tag, or select from a list of tags you have already added. Click any key name to bring up the key editor dialog box. Note that this option is only available to project admins and can be turned off globally in the project settings. You can also open the key editor by clicking the Add key button or striking Ctrl+K on your keyboard. In this case, the key editor will contain default setting values and you will be able to create the new key from scratch. Alternatively, you can copy existing keys by using the Duplicate key icon next to the key name, and then only adjust the required fields. After you have finished editing, click the Save button in the bottom left corner of the floating box, or hit Ctrl+Enter on your keyboard. Enter your key name here. The key value in the base language that you want to be translated. Platforms to be associated with the key. Different platforms have different file export formats; each key can be assigned to one or multiple platforms. A description to help project contributors understand the context. Add existing tags or create new ones to facilitate filtering and export. Turn on to keep the dialog window open after you click the Save button. This may be useful when adding/editing multiple keys in a row. Create multiple keys using a predefined pattern as a part of the key name. Click the Save button or press Ctrl+Enter to apply the changes. Turn on if the target key has plural forms. Lokalise will automatically add the necessary plural forms for each language. Optionally, each key can be assigned to a file (one filename per platform). Turn on to hide this key from contributors. Context is used with some file formats (e.g., .po). You only need this if the context is actually used in the code, otherwise skip this setting. Set the character limit for this key values. Longer strings will not be accepted. However, this setting will not affect existing translations. 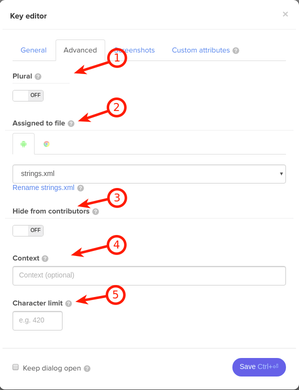 You can use custom attributes to define format-specific options for the target key. Example: Android Resources (XML) files can have a “translatable” attribute set to false. To access the screenshot manager, simply click the Screenshots icon in the key icon menu. A floating box with the current key name in the header will appear. Please note that this option is only available to project admins with the Manage screenshots permission. Here, you can link already the current key to screenshots uploaded earlier. To do this, simply click the desired screenshot(s) and then click the Link selected button in the upper right corner. 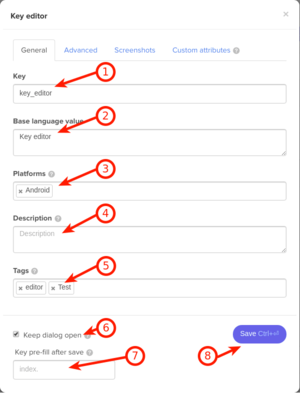 The screenshots you upload here will be automatically bound to the current key. You can drag and drop screenshots to the designated area or manually select a file from your computer. Mark the Try to find keys on images option if you wish Lokalise to scan the screenshots for you. Each translation value has several buttons next to it: these provide translation-related functionality. Some of the available actions are flags - e.g., reviewed, unverified; others open an additional floating panel. Lokalise automatically checks spelling and grammar in the editor as you upload or update the translation strings. In case a spelling or a grammatical error is found, a small icon will appear on the right side of the translation field. Users with the reviewer role can mark translations as reviewed in the editor and approve any translations added by other contributors. Use the Unverified flag to mark a translation you do not consider 100% correct. Unverified translations can be conveniently reviewed later using preview filters in the editor. Translation history keeps all versions of each translation update you have ever made. Click the icon to see the translation history for the target item.